Over the years, sun exposure, smoking, and other nutritional factors cause both a loss of skin elasticity and of subcutaneous fat, creating unwanted wrinkles and folds and, in some cases, an appearance of years beyond age. Dynamic lines are the result of muscle tension – the muscles of the face squeezing the skin. Static lines, meanwhile, are result of environmental factors like sun damage, wounds, and even just the force of gravity over time. 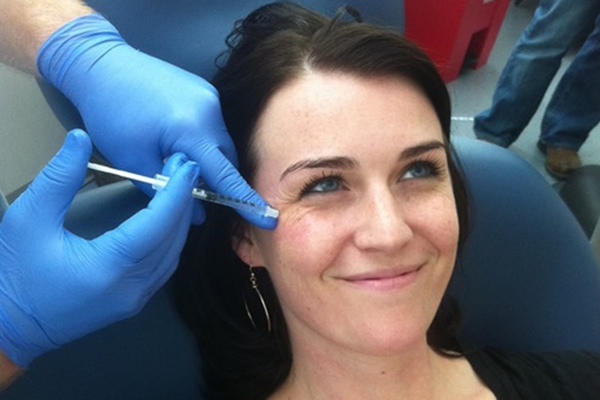 In practice, we use botulinum toxin injections in order to attend to the dynamic lines. BOTOX®, as it is commonly known, provides dramatic benefits with minimal complications. The procedure is safe, effective, and quick as can be, which makes it perfect for busy people trying to balance work, family, and social responsibilities. Often, women who start in their thirties are able to limit the chronic damage that comes of dynamic aging. The most commonly addressed areas include: the “crow’s feet” at the corners of the eyes, the “worry lines” of the forehead, and “frown lines” between and just above your eyebrows. We use Juvaderm® to attend to deeper wrinkles, including marionette lines and the lines that appear at the corners of your mouth. This treatment is minimally invasive and the nourishing effects last for a year up to 18 months. Also with Juvaderm, we can often efface the “parentheses” that may eventually frame one’s nose and the deep fold that runs from the nose just above the upper lip (also known as the nasolabial fold). Finally, we use Voluma® to create a more youthful profile by adding volume lost to aging in the area of the cheek, creating a subtle lift. The procedure provides natural-looking results that last up to two years. Voluma is the first and only FDA-approved injectable gel for the cheek area, and contains modified hyaluronic acid made from a naturally occuring complex sugar.